Part musical comedy, part vaudeville, and part social satire, Fine and Dandy wasn’t quite like any other show of its era. On the surface, it all seemed pretty standard: the novelty setting (here, a Tool and Die Factory), the chief comic with the sputtering monologues, the soubrette who’s there chiefly to lead the dance numbers, the star-crossed lovers, and the triple wedding just before the final curtain. 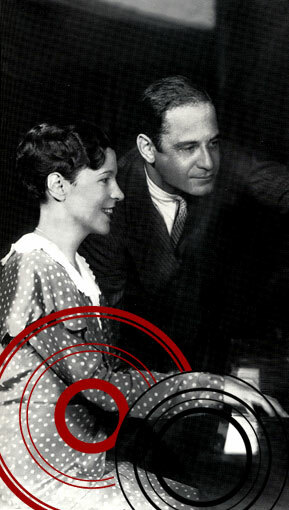 But the combination of star Joe Cook (one of the most popular entertainers of his day), humorist-turned-librettist Donald Ogden Stewart, and the team of Kay Swift and Paul James (left), penning their first book musical, proved invigorating. The critics, high in praise, couldn’t tell where Cook’s antics left off and Stewart’s spoofing began, if the more pointed barbs were scribed by Stewart or by James, or how the songwriters managed, in the midst of all this tomfoolery, to assemble a score that reflected the show’s setting, characters, and concerns. 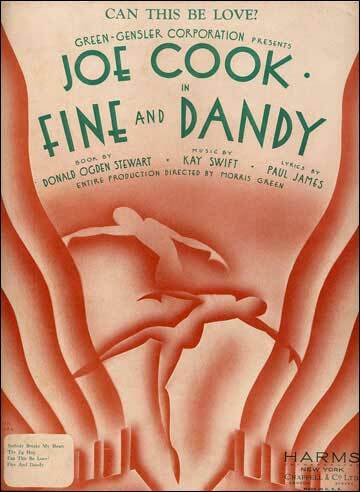 Kay Swift and Paul James never wrote another musical together, but it’s a safe bet that if they’d written a dozen, you’d still remember which tunes were from Fine and Dandy. Even the song titles – “Starting at the Bottom,” “Rich or Poor,” “I’ll Hit a New High” – reflect the promise of upward mobility at the heart of Stewart’s satire. And then there’s the sound. Saxophones began to filter into the Broadway pit orchestras by the mid '20s, but Fine and Dandy truly leapt into the '30s with its saxophone-driven reed section. Filtering the merriment of the Jazz Age through the sounds of early swing, Kay Swift and orchestrator Hans Spialek paved the way for the Gershwins’ Girl Crazy later that season – and for a host of rollicking musicals to come. 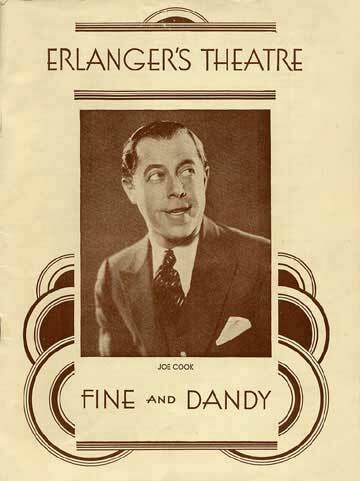 In one respect, however, Fine and Dandy was just like most other musicals of that era: it was an entertainment, designed to run perhaps a season on Broadway and another on the road, and when it finally closed, no one gave much thought to preserving the performance materials. In the case of Fine and Dandy, as years passed, original orchestrations survived for only one number (“Nobody Breaks My Heart,” by Spialek); dance music and vocal arrangements were lost; and aside from the six published songs (“Rich or Poor,” “Starting at the Bottom,” “Can This Be Love?”, “The Jig-Hop,” “Nobody Breaks My Heart,” and the title song), the remaining tunes existed in varying states of disarray – some in multiple versions, as Kay herself, late in life, tried to recall these forgotten melodies. Although significant manuscripts were preserved in the Kay Swift Papers at Yale University, at the New York Public Library for the Performing Arts, and at the Library of Congress, these materials were often wildly contradictory, reflecting the heavy rewriting and improvisation that went on not only during the rehearsal and tryout period, but throughout the show’s original run. Orchestrator Russell Warner began work with Kay in the mid ’80s, as she began to reconstruct everything from original keys and tempi to song routines, alternate lyrics, melodic tags and orchestral fills. By and large, the restoration of Fine and Dandy owes its greatest debt to Kay and Russell’s exhaustive collaboration up till her death in 1993, and then to Russell’s continuation of that work for a decade after. It was also guided by invaluable performance tapes that Kay herself made in the late ‘70s with music theatre historians Robert Kimball and Alfred Simon by her side. This new recording draws from all those efforts, as well as from some more unusual sources. Hidden among Kay’s papers in the Yale collection was a privately-produced vinyl disc of a dance band playing a tune called “Give Me Some New Birds”; it turned out to be an early version of “The Jig-Hop,” so Aaron Gandy and Larry Moore used it to create the dance arrangement heard here. (The disc dates from 1928, explaining why “The Jig-Hop” seems the one generic piece in the score – it was in fact a trunk song; but a good tune being a good tune, Swift and James clearly reasoned it would work well as the big Act II dance number – which it did.) And in the spirit of the original production, key material was improvised and tailored to this new cast – most specifically, the title song, for which lyrics to over a dozen refrains survived, with no indications of which were actually used, or in what order. In rehearsal, Carolee Carmello and Mario Cantone met the challenge with all the gusto of Joe Cook himself, making sense out of reams of typed and handwritten manuscripts – and imbuing them with their own sense of joy. Purchase the Fine and Dandy CD from Amazon.com.